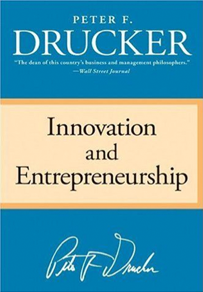 Like the discipline of management, which he helped found, Drucker believes that innovation and entrepreneurship must be undertaken as a purposeful and systematic discipline. Drucker suggests seven clear signs that indicate opportunity for business innovation: (1) unexpected success, (2) incongruity between reality and ideal, (3) identification of an unmet need, (4) changes in industry or market structure, (5) demographic shifts, (6) changes in public perception, and (7) discovery of new knowledge. By watching for these signs to identify an opportunity, then creating and acting on a systematic plan to deliver a valuable product, businesses can create new value. “Innovation and Entrepreneurship” explains why business leaders must make innovation and entrepreneurship “a normal, ongoing, everyday activity, a practice in their own work and in that of their organization.” This classic book on innovation and entrepreneurship should be required reading for today’s business people. 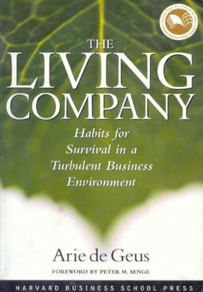 In The Living Company, Arie de Geus reveals the keys to managing an organization for a long and prosperous life. He draws a sharp contrast between “living companies,” the purpose of which is to fulfill their potential and perpetuate themselves as ongoing communities, and “economic companies,” which are in business solely to produce wealth for a small group of individuals. De Geus contends that living companies manage for survival; economic companies manage for profit. Among a wide array of important factors, long-lived companies have four essential traits in common. At a minimum, these firms are sensitive to their environment in order to learn and adapt; cohesive, with a strong sense of identity; tolerant of unconventional thinking and experimentation; and conservative in financial policy to retain the resources that allow for flexibility. “The Living Company” is worthwhile to leaders at all levels. With hundreds of well-known management practices and prescriptions promoted by consultants and available to business, which are really effective and contribute to the growth and continued success of a company? Which do little or nothing? Through a 5-year study the authors set out to find the management practices that actually promote long-term growth and success. Analyzing data on 200 common management practices the authors developed a “4+2” (4 primary and 2 of 4 possible secondary) formula made up of practices that, if followed carefully, lead to sustained business success. Companies they identify as winners consistently followed successful practices in all four of the primary areas (strategy, execution, culture and structure) and any two secondary areas (talent, leadership, innovation, and mergers and partnerships). The key to long-term success, they argue, is implementing effective programs in the six areas simultaneously. Herman Simon defines “Hidden Champions” as medium-sized, unknown companies that have quietly, under the radar, become market leaders in their respective industries. Going inside more than a thousand hidden champions around the world, Simon reveals the common patterns, behaviors, and approaches that make these secretive companies successful by resisting popular management fads, and pursuing such common-sense strategies such as focusing on core capabilities (defining a narrow market), establishing long-term relationships with customers, innovating continuously, build a strong corporate culture, and developing a global presence. 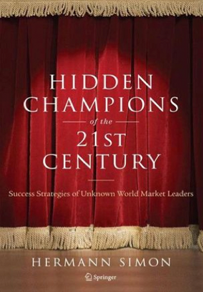 The hidden champions represent a clear contrast to the shortsighted practices that have brought many corporate giants crashing down, and prove that even management in the 21st Century should be based on healthy common sense. 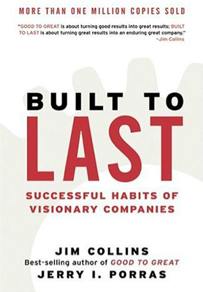 “Built to Last” is one of the most influential business books of our time. Jim Collins and Jerry Porras, identified what makes visionary companies – ones that beat consistently beat their competitors, withstand changes in the marketplace, make a significant impact on the world and have outperformed the stock market by 15 times since 1926. The authors conclude that a visionary company is not contingent on one brilliant CEO, but on elements that transcend any individual leader. Companies such as Boeing, Walt Disney, Nordstrom, Wall-Mart and General Electric share fundamental characteristics that distinguish them from less visionary companies, such as: preserving a fixed core ideology, yet having the ability to adapt; going beyond culture to embrace “cultism”; creating what the authors call BHAGs (big, hairy, audacious goals); mimicking the biological evolution of the species; and having a strong sense of purpose beyond making money. 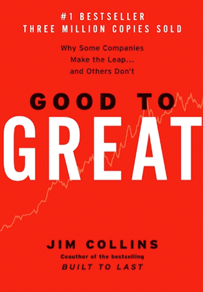 In what Collins calls a prequel to the bestseller Built to Last he wrote with Jerry Porras, “Good to Great” explores how good or even mediocre companies can be turned into ones that achieve long-term superior performance. To find the keys to greatness, Collins and his team identified 11 companies that made the leap from Good To Great and discovered the characteristics of greatness—why some companies make the leap and their industry counterparts don’t. Collins introduces concepts such as Level 5 Leaders, The Hedgehog Concept, A Culture of Discipline, Technology Accelerators, and The Flywheel and the Doom Loop. 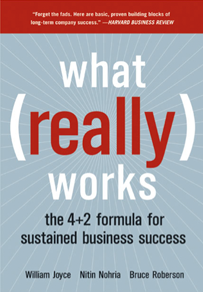 The findings provide valuable insight to anyone building a company with the potential to become great and enduring. While some of the findings may be counterintuitive, most are simple and common sense. “Good to Great” doesn’t hold all the secrets to success but it is smart, thought-provoking, compelling and tackles big questions. 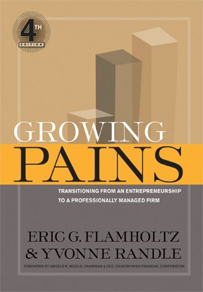 The overarching topic of Growing Pains is how small entrepreneurial firms make the transition to a professionally managed firm. The authors identify and discuss six organizational development areas that play a deciding role in the successful growth of a business. Flamholtz and Randle use these developmental areas to isolate what must be done during seven stages of organizational growth. Growing Pains also describes a set of organizational growing pains that commonly arise when organizations struggle to manage their growth. Great companies don’t just depend on strategies—they depend on people. But, half of all employment decisions result in a mis-hire: The wrong person ends up in the wrong job. Any mis-hire can be damaging and a key mis-hire can be disastrous. 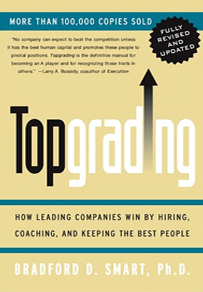 The Topgrading concept is designed to make certain that you have the very best opportunity to add ‘A Players’ to your team and avoid the high cost of mistakes.Topgrading works for companies large and small in any industry. Dr. Smart spells out his practical approach to finding and managing A-level talent, as well as coaching B players to turn them into A players. The best businesses have clear expectations about what level of talent is acceptable and what isn’t. This book is a tremendous guide if you are serious about evaluating and developing talent. A legendary CEO and a top consultant team up to unravel one of the biggest problems in business today: delivering results. Together they’ve combined their knowledge and experience on how to close the gap between what a company’s leaders want to achieve and actual results. 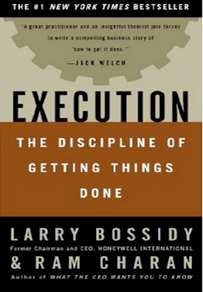 The discipline of execution is an understanding of how to link together people, strategy, and operations, the three core processes of every business. Making these processes work together is the real job of running a business, not formulating a “vision” and leaving the work of carrying it out to others. Execution is a very important reminder that in the end business is about results and the only way you produce results is by executing. It’s not rocket science, but on the other hand a lot of business isn’t rocket science. In The Five Dysfunctions of a Team, Patrick Lencioni offers a leadership fable that is thought-provoking and instructive. 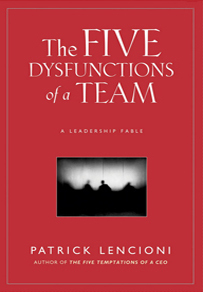 Throughout the story, Lencioni reveals the five dysfunctions, which go to the very heart of why teams, even the best ones, often struggle: absence of trust, fear of conflict, lack of commitment, avoidance of accountability, and inattention to results. He outlines a powerful model and actionable steps that can be used to overcome these common hurdles and build a cohesive, effective team. Every manager or executive will recognize the situations described in this book. Just as with his other works, Lencioni has written a practical and compelling story with a deceptively simple message that has become a must-read guide on how to build and manage successful teams.